Bert Amason, a Mountain Brook resident enjoyed being able to lend his support to the local food industry. 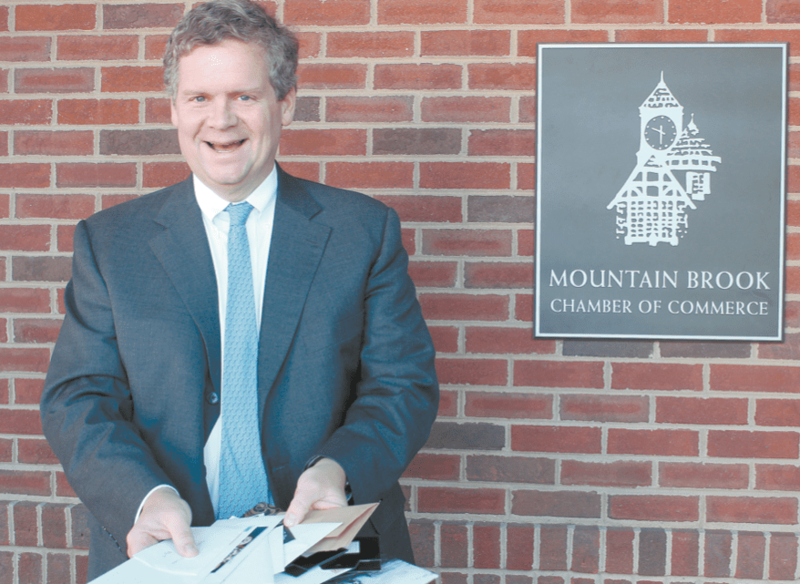 He picked up his grand prize gift cards at the Mountain Brook Chamber of Commerce. Photo courtesy Mountain Brook Chamber of Commerce. In 2018, Mountain Brook Mayor Stewart Welch came up with the idea to host a Restaurant Trail challenge, inviting community members to visit 48 of the city’s restaurants in one year for the chance to win a grand prize of gift cards and packages from participating establishments. He couldn’t imagine who ate out that much, but the task didn’t feel so insurmountable after he had knocked the first few off his list. After clearing the first three restaurants, Amason set the goal of eating at all 48. To verify each meal, Amason posted a photo taken at each of the restaurants on Instagram along with #i8mb. “There were actually a bunch of repeats that you don’t get credit for – places that we eat on a normal basis,” Amason said. Completing the contest challenged him to try out places he had never been before and some places he had never heard of before, which surprised him considering how long he has lived in the city. Not a life-long resident but a majority-of-life resident of Mountain Brook, Amason also enjoyed being able to lend his support to the local food industry. Not only was the challenge fun for him, his family wasn’t complaining along the way. “My kids loved deciding to go get beignets in the morning at Another Broken Egg, going to get Breakup Cookies at Church Street Coffee and Books, getting ice cream at Mountain Brook Creamery. We also went and picked up cookies at Olexa’s one day, so it was a lot of fun for them,” he said. Once the Mountain Brook Chamber of Commerce began running promotional videos announcing the first few finishers, Amason realized that there would be plenty of competition for the grand prize. “I think in all we had about 28 finishers and I was just happy to hear my name drawn,” to win the grand prize package, Amason said. Fellow finishers included Abby Nevins, Stewart Welch, Janet Forbes, Sam Gaston, Jackie Nesmith, Sue and Matt Abele, Holley Wesley, Alex Valencia, Elizabeth Riddle, Joshua Osborne, Kristen Osborne, Allison Savela, Julie Edwards, Steve Boone, Felicia Stewart and family, Samantha Chandler, Heather Scott, Food Baby Bham (Hunter and Alexandra White), Chris Mullins, Kristy Smith, Ashley Lyerly, Dylan Angeline, Monica Sargent and Layne McDougal. “I was hoping that the next challenge would be visiting all of the gyms,” Amason joked. While he is waiting, he’s been revisiting spots along the trail to use the gifts he won. He’s already treated his family to dinner at La Paz, Char Bar and Icehouse. Having now visited most of the city’s restaurants, Amason gave his suggestions for places to eat this Valentine’s Day. His thoughts: it all depends on the mood you’re looking for.